Northern Jordan – with its rolling hills, ancient ruins, slower pace, and community-based tourism initiatives – has much more to offer than one day allows. Don’t make the rookie mistake of a quick trip to Jerash. 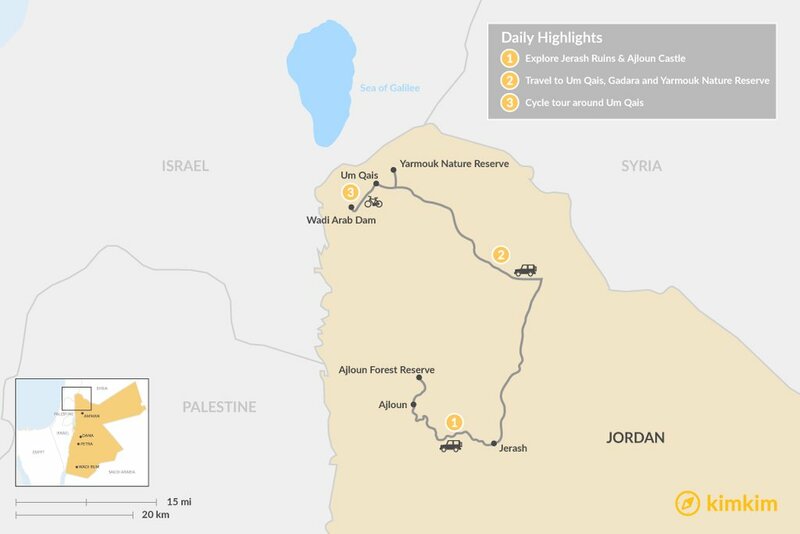 Read on to see why you should set aside at least three days for your northern Jordan adventure. 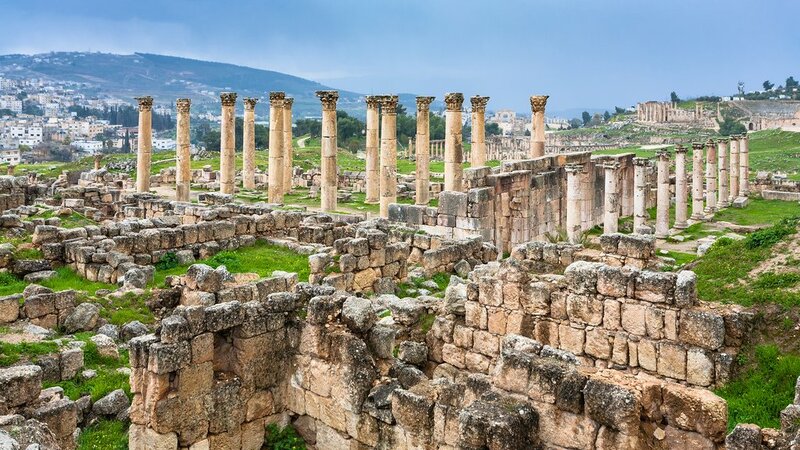 Spend the morning exploring the ancient Greco-Roman ruins of Jerash – one of the world’s best-preserved Roman cities. You’ll be doing a lot of walking as you wander from Hadrian’s Arch and through the plazas, strolling the Corinthian colonnaded street, and admiring the historic temples and theater, so be sure to wear comfortable shoes and carry plenty of water. Take a break for lunch – at Jerash Rest House inside the ruins or Lebanese House, a local favorite offering indoor and outdoor seating options – before continuing further north to Ajloun. An afternoon in Ajloun is best spent enjoying the panoramic views from atop Ajloun Castle or connecting with nature in Ajloun Forest Reserve. Request a customized, guided hike through the forest for a chance to find wild pistachio and strawberry trees or spot local species, such as the Stone Marten or Striped Hyena. Ask our specialists to arrange dinner with a local family, where you can try a truly authentic, home-cooked meal. After you’ve had your fill and gotten more acquainted with local tastes and culture, retire to Ajloun Cabins where you can take in the sights and silence of the surrounding evergreens and pine trees from your private balcony. Be sure to ask our specialists about seasonal events and celebrations. Jerash often hosts concerts, and if you time your visit right, you may have the unique opportunity to listen to live music in the ancient ruins. After a peaceful night in nature, you’ll be well-rested and ready to set out early for Um Qais. There is no better way to understand the history and culture of a place than through its people. 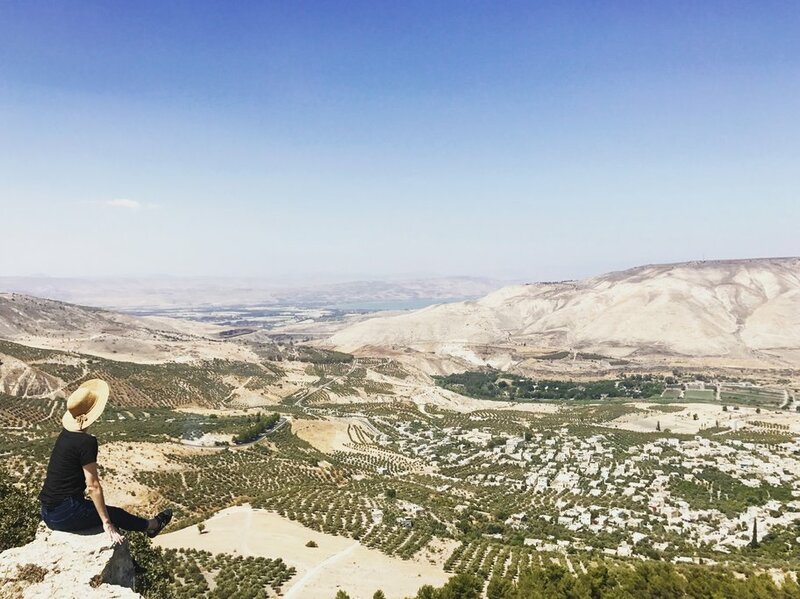 Meet your local guide who will take you inside the Greco-Roman ruins of Gadara and back in time through the history of this important site, before leading you to a local farm where you will help harvest some ingredients for your lunch. Continue on to a family home where you can lend a hand in the kitchen and learn from a local through a Jordanian cooking lesson. Or – if you prefer to leave all things culinary to the experts – hand your harvest over to the chef and take a break with some tea while your meal is prepared. When you are sufficiently fueled up with local flavors, it’s time to lace up your hiking boots and head out for a guided hike through Yarmouk Nature Reserve. Stop to rest in the shade of deciduous oak trees and enjoy views of the Yarmouk River, Syria, and the Sea of Galilee. If you prefer to extend your stay in the great outdoors, ask our specialists to book the camping option and spend a night under the stars, swapping stories around the campfire with a local guide. Or, if you require a few more creature comforts than camping can offer, book a night at cozy, community-minded guesthouse Beit Al Baraka. 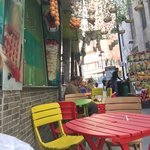 Whether you wake up in a tent in Yarmouk or your bed at Beit Al Baraka, be sure to book Baraka’s breakfast. This hearty, locally-sourced meal is exactly what you need to jump start a full final day in northern Jordan. Set out on a guided, half-day cycling tour through the village and surrounding areas to get a glimpse of local life and landscapes. As you pass by important landmarks – such as Golan Heights, Al Arab Dam, and Lake Tiberias – the knowledgeable local guide will provide more details and history to help you better understand Um Qais. Return to Beit Al Baraka for lunch or opt to eat at a local family home before continuing on to another engaging activity. 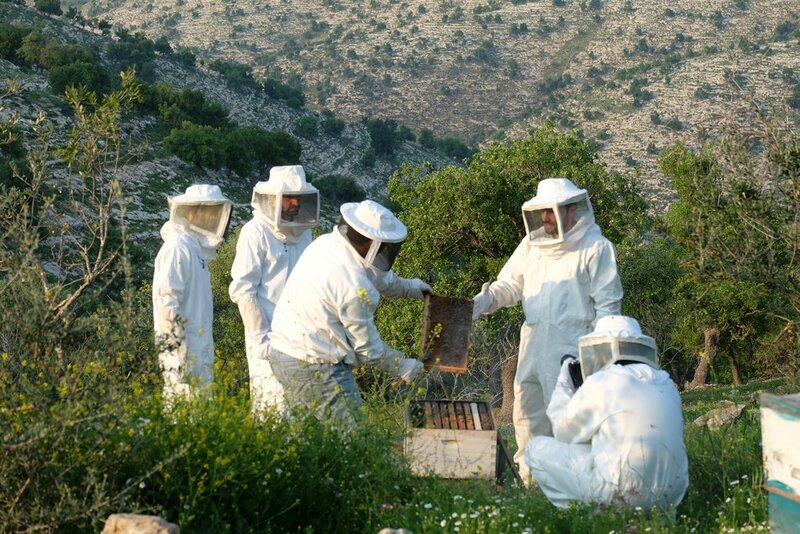 You can try your hand at basket weaving with a local expert or suit up and learn about beekeeping from a passionate local beekeeper. End your day with a soak in some hot springs or catch a view of the sun as it sets over the Sea of Galilee. Or simply relax on the rooftop of Beit Al Baraka with a hot tea, enjoying the serenity, sweeping views, and sounds of the daily call to prayer as your northern Jordan adventure comes to a close.